He replaced Julie Anne Gilbert who had earlier ‘expressed her wish’ to return to a previous role of head of infants, and the seniors’ former head, Khalil Ahmed, whose services were dispensed with suddenly by new international owners, Inspired, which also operates private schools across Europe, Australia, Africa and Latin America. From the English northern town of Bolton, Jeff has a British Army military background and is married to Heather. They have three children, Helen, 27, a senior staff nurse, Joseph, 26, an NHS physiotherapist and Elliot, 21, who has just finished his degree in sports sciences and is just starting a two-year Masters at Newcastle. They have a grandchild, Sebastian, three, and one on the way. He’s more than just a safe pair of hands and packs a powerful educational résumé having joined the teaching profession in the UK as a physics graduate, rising swiftly up the ranks to head of science and deputy head. He moved overseas to Indonesia for his first headship in 2003 at the British International School in Jakarta, moved back to Europe to lead Guernsey Grammar School before growing Dubai’s Deira International School from 1,100 to 1,700 students and improving its assessment from ‘acceptable’ to ‘outstanding’. “The school had some problems when I got there seven years ago,” he explained. “There needed to be a big upgrade, they needed to improve on the teaching and learning processes and there were a lot of management issues. “I had always looked at spending six or seven years in a school and managed to gain a bit of a reputation for improvement, so when I got approached about this, I relished the challenge of the whole BSB project. “I saw its potential and I liked what I heard about Inspired’s views and plans. We can already see ways to get things moving quickly. We are going to do a tremendous amount of work. “The school has a good reputation and its examination results, like the ones they’ve just got for A levels and GCSEs, have been exceptional, but there was an admittance by all that it needs to develop its leadership. “It’s about bringing all three schools together under one model rather than operating as three quite independent entities. It’s about bringing it together, with equal standards all the way through the school, with a common assessment practice and united themes. “There is always room for improvement. This is not going to be a school that sits on its laurels and thinks that we are there and have arrived, we are going to be monitoring and evaluating very closely and we are actually going to be always looking to change and improve things. “It’s going to be about whole school development with our teachers, middle leaders, leading the development. He appreciates when there’s constant change at a strategic level of governance and management, understandably, staff members ‘do not feel safe and comfortable’ and that can be a problem. “You have to win back hearts and minds,” he said. “I have spoken to the staff about putting their trust back in the system. There are some fantastic people here and they just need an opportunity to develop. “I also met a lot of the students too when I came here on my initial walk around. They sort of interviewed me. It absolutely confirmed what I had heard about the students at BSB, about their good nature, their goodwill, how they work together and just how lovely they are. Finding out background information on BSB was a simple affair; the senior staff changes in the past decade have been well documented in this newspaper, with head teachers coming and going and it once witnessed a mass exodus of staff as 60 per cent of teachers and senior managers either handed in their notices or failed to have their contracts renewed. The school, however, is now part of a global group educating more than 26,000 students across an international network of 32 schools on five continents. Inspired’s group education director Dr Stephen Spurr is a well-respected name in education circles, a former Eton College head of classics, headmaster of Clifton College and Westminster School. “At first it was more a process of ‘do I believe in what Inspired wants to achieve and does its plans match my aspirations?’ I found very good alignment – we know exactly where we want to go and what needs to be done,” Jeff said. One of BSB’s unique selling points since it moved from its ‘Dickensian’ home in Adliya to Hamala in 2008 was having a ‘one site for all ages’ campus. But the school now has 2,650 pupils on its roll and space, plus traffic congestion around the site, has become a challenge to put it mildly. Inspired earlier this year announced plans to build a separate senior school which would allow more space on its current campus for younger pupils. Land, he has been told, has been secured reasonably close by and the proposed timescale to open the new secondary school doors is September 2020 which he described as ‘sensible’. “What they are doing at the moment is looking at different models, architectural plans and deciding which way to go,” said Jeff. That regular but beautiful theme of Bahrain’s warm welcome raised its pretty head again too. “Bahrainis want to work with you and they are very, very welcoming. That was my first impression,” he said. 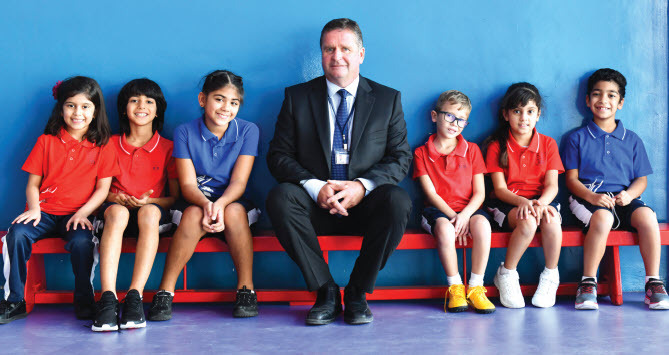 BSB is a member of the Council of British International Schools (COBIS) and during his time in Dubai, Jeff’s school became active members of rival network the British Schools of the Middle East (BSME), and he frequently came across St Christopher’s School former principal, Ed Goodwin. He’s yet to meet Ed’s replacement although he knows of Dr Simon by reputation. “I don’t know him but, hopefully, we will get together soon and meet up. If you know Dubai, there was tons of rivalry between different schools and we got rid of that. If you work with people at head of school level you can achieve so much and feed off each other, share information and help each other. Since the acquisition of the school by Inspired, investment has been made to make improvements and enhancements, including an expanded and redesigned cafeteria, a redesigned entry in infants, a new library in the senior building and enhanced drama and music rooms. 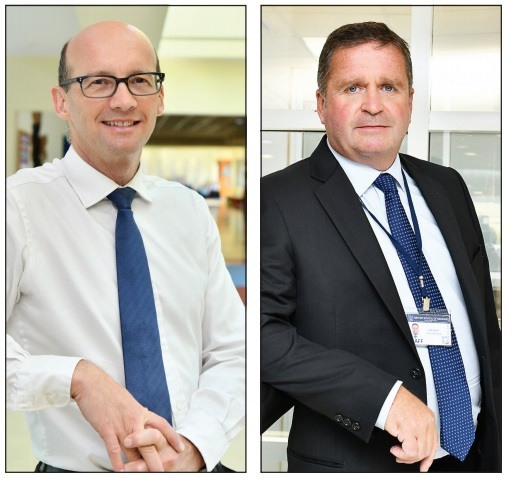 The owners believe the appointment of Jeff as executive head and head of the senior school, and the newly-defined and strengthened management structure working with him, including Julie Anne as head of infants and Robert Howe as head of juniors, was an inspired move with ‘a leadership team of the highest calibre’. “These are exciting times for the school and children as we build on the existing success of BSB,” Inspired said.